Our Abpromise guarantee covers the use of ab7007 in the following tested applications. Flow Cyt 1/100 - 1/250. 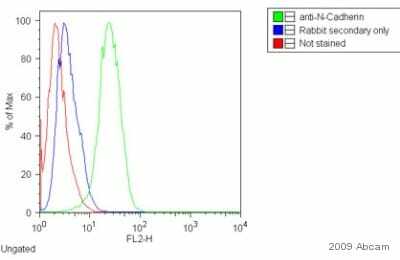 The maximum amount of reagent required to stain 1 x 106 cells in flow cytometry is approximately 1.0 ug of antibody conjugate. Ab7007 was used with the primary antibody ab18203 in Flow Cyt. See Abreview on ab18203. Ab7007 was used at dilution 1/250 with the primary antibody ab24182 in ICC/IF. See the review on ab24182. Publishing research using ab7007? Please let us know so that we can cite the reference in this datasheet. Customer kindly contacted us to inquire about the immunogen sequence for ab56215. Thank you for contacting us today regarding secondary antibodies. I have made a short list of compatible antibodies for use withab56215 Anti-SLC4A4 antibody.These products are pre-absorbed to ensure minimum cross reactivity. Each product is conjugated a different fluorochome so that you may chose the one which best fits your experiments. Please let me know if you have any questions. If testing live cells we also recommend cell viability controls such as 7-AAD orPropidium Iodide.Propidium Iodide (PI) binds to double-stranded DNA. PI cannot cross intact plasma membrane and therefore will only be present in DNA of cells where the plasma membrane has been compromised/ permeabilized. 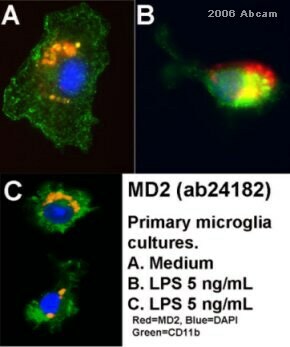 We do carry PI and offer a 7-AADCell-Mediated Cytotoxicity Assay Kit. In reviewing the datasheet for this product I did note that it has not been tested in Flow Cytometry. As such we cannot guarantee ab56212 in that application. However by participating in our AbTrial program, you can now use our products in an untested application or species without financial risk. 1. Reply to this e-mail to let me know that you would like to proceed and test this product in Flow Cytometry. 2. I will email you aninactivepersonal discount code for the value of the product. 3. Purchase and test the product at regular price. 4. https://www.abcam.com/abreviews with you results noting your AbTrial discount code in the additional notes section. 5. Once the Abreview is submitted, the discount code will becomeactive. High FACS signal from secondary-only control. What modification do you suggest? Thank you for your reply. Your protocol looks correct. The only possible issues I see are the concentration of the secondary antibody that you incubate with the cells but more importantly, the lack of saponin in the wash buffer. The saponin permeabilization is reversible, so your washes will not be effective if they do not include saponin. I am guessing that, without the saponin in the wash buffer, the membrane is not permeabilized, and the secondary antibody PE conjugate is retained in the cells. For the secondary antibody, are you adding 10ul of the stock antibody solution, undiluted? If so, then the concentration is too high. For FACS, the datasheet recommends that the cells receive should be 1/100 - 1/250, but I suggest diluting it even more, given the relatively low number of cells in your suspension (compared to 0.5e6 - 1e6 per 100ul) . I recommend, if you are not already doing this, diluting the ab7007 to a dilution of 1/50 with the buffer you use to dilute the primary antibody (with saponin) and then add 10ul of this to your 100ul cell suspension. This will be a final dilution of 1/500. The primary antibody should be at a final dilution of 1/30. I do not think the FcR blocker is the problem. You may want to try a test without it, just one tube of cells, to see if it is effective or if it is somehow contributing to the unusually high signal. That may be the case if the secondary antibody has some affinity for the blocker. Unlikely, but possible. Please let me know if you have any questions or if the problem persists. Thank you for your enquiry and interest in our products. In order to be able to search the compatible secondary antibodies, first it is important to consider the isotypes of these two primary antibodies: ab9568 - mouse IgG1 kappa ab109022 - rabbit IgG1 I would advise you and your customer to use our recently developed advanced search facilities for secondary antibodies: https://www.abcam.com/index.html?pageconfig=productmap&cl=918 I have conducted some search for you and you can find some compatible antibodies: For ab9568: ab99605 - Rat monoclonal [SB77e] Secondary Antibody to Mouse IgG1 (PE), pre-adsorbed ab99912 - Goat polyclonal Secondary Antibody to Mouse IgG1 (PE) For ab109022: ab97070 - Goat polyclonal Secondary Antibody to Rabbit IgG - H&L (PE), pre-adsorbed -Donkey F(ab')2 polyclonal Secondary Antibody to Rabbit IgG - H&L (PE), ab98441- Donkey F(ab')2 polyclonal Secondary Antibody to Rabbit IgG - H&L (PE), ab98494- Donkey F(ab')2 polyclonal Secondary Antibody to Rabbit IgG - H&L (PE), pre-adsorbed, ab7007- Donkey F(ab')2 polyclonal Secondary Antibody to Rabbit IgG - H&L (PE), pre-adsorbed, ab72465 - Goat polyclonal Secondary Antibody to Rabbit IgG (PE), pre-adsorbed I hope this helps and if I can assist further, please do not hesitate to contact me. Please confirm that this antibody has been tested for application in IHC-frozen sections, and if yes, what dilution is recommended. Thank you for your phone call. I checked with the originator of this antibody and they informed me that it was not specifically tested for application in IHC-frozen sections or formalin-fixed paraffin embedded sections. I have updated our datasheet to reflect this. It was tested in Immunomicroscopy and Flow Cytometry / FACS and can be used in other antibody based fluorescent assays requiring extremely low background levels, absence of F(c) mediated binding, lot-to-lot consistency, high titer and specificity. It should work, however, for IHC-frozen sections and the originator recommended using a 1:500 dilution. If you want to return the antibody, please let me know and I will inform you as to how to proceed.